Cousin Hannah (and her parents) came to visit this past weekend. 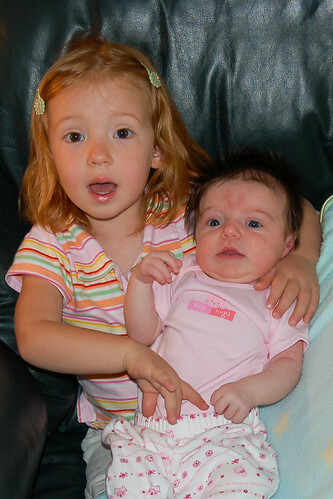 Even though we've heard about the Terrible Twos, Hannah was extremely patient and very gentle with Evelyn. The weekend visitors showed up in their "cool" new vehicle. So now all of Evy's cousins cruise around in mini vans. But she's not buckling under the pressure. Evelyn's grandparents did not get a minivan until the kids were in middle school,( 1984--kids were 9, 11 and 13), but they did have a station wagon before that. It is necessary to have a lot of space to put kids and all their stuff. You will find out! Grandma C.
Ahh, Mumma. We hate to use the interweb to disprove your patience in upgrading to a minivan, but as it turns out, the minivan didn't even exist in this country until 1984. We're guessing that before that, you just threw the kids (Mom, Aunt Steppie, and Uncle Bob) into the rear-facing seat in the back of the station wagon and crossed your fingers that a Pinto didn't rear-end you.